Australia’s First Music and Dance Teaching Cooperative. Browning Street Studios (established 2008) is owned and operated by the West End Music and Dance Teachers’ Cooperative. The West End Music and Dance Teachers’ Cooperative Ltd is a registered Non-Trading Cooperative under the Cooperatives Act 1997 (Queensland). The Cooperative was officially registered with the Queensland Office of Fair Trading on July 23, 2013 (Cooperative # QC0324). We are governed by a Board of Directors, democratically elected every year from our membership. Co-operatives were first established over 500 years ago and are one of the oldest types of business (NSW Federation of Cooperatives, 2013). Co-operatives are founded on ethical principles including honesty, openness, social responsibility, equality, solidarity and caring for others. Despite there being over a billion members of co-operatives worldwide, as a business structure co-operatives are not well understood. According to Kendall (2013), Eight out of ten Australians are a member of a co-operative or mutual, yet only 30 per cent know they are a member, or can actually name a co-operative.Car-owner clubs, like the NRMA and RACQ, and credit unions are examples of successful co-operatives in Australia. Some of the biggest local co-operatives are involved in the agricultural industry. 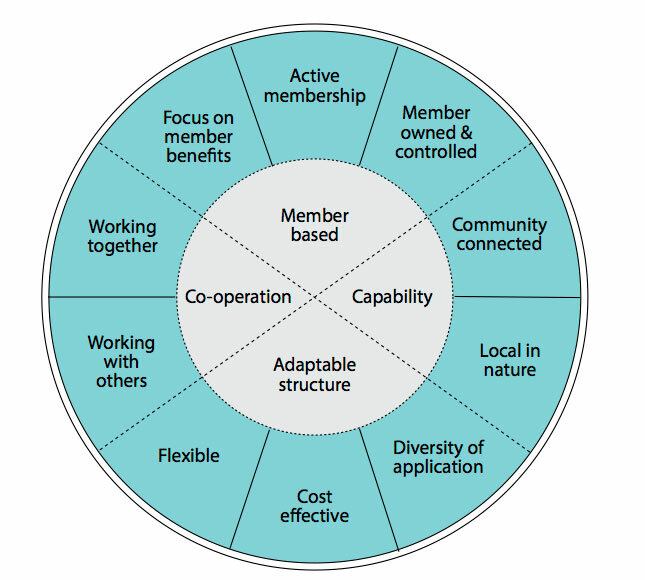 Ultimately, a co-operative is operated by and for its members. This form of business structure contrasts, for example, with large public companies operated in the interests of often distant shareholders, who may have very different objectives to the actual communities in which the companies operate. Co-operatives can provide a more intimate link between community and business and can be operated in the long-term interests of both (Kendall, 2013). (d) strategic accumulation of spaces, equipment, assets, tools of trade and other resources for the benefit of members and the broader community. Here at Browning Street, we do things a little differently. We were founded in 2008 as a community enterprise, run by a collective of music teachers dedicated to quality music education within a framework of building sustainable livelihoods for local musicians. In 2013 we made history by becoming Australia’s first music industry cooperative. Worker-ownership of our collective enterprise means that workers also “own” their jobs, set their hours, agree on wages and work priorities. In turn, we choose to do types of work that are based on our skills, capacities, passions and talents – what we see ourselves doing well into the future. We ask the question, “what amount of income do we need to support and nurture ourselves as people first?’ as well as “what is fair to charge persons accessing our professional services?”. Our pricing structure is based on a sustainable, living wage for musicians. As workers own the fruits of their labours (i.e. are directly rewarded for working hard), workers can decide just how much work is right for the balance in their lives. Also, time invested in building skills and resources such as, say, a professional library – directly benefit the worker’s own business. What’s most important about the Browning Street difference is that teachers have a DIRECT relationship with students. The cooperative doesn’t “own” your client, you get to work directly with students. So any effort or work you put into building relationships with your students and other clients directly benefits that relationship. In a more conventional business model, clients are rationalised in terms of “units” of product sold. Business is focussed on maximising the amount of clients for the minimum amount of investment. That often, also, includes a minimum investment in staff. “What is the least amount of money I could get someone to do this work for?”. Paying a premium rate for services such as music lessons creates an unspoken contract between customer and service-provider. In the case of commercial music schools, teachers may only receive a small percentage (sometimes only 30%) of the money that has actually changed hands, but they are still the primary service-provider to the person that has paid this amount of money. It becomes difficult to provide a “premium” service when the teacher themselves see such a small percentage of the money that has changed hands. While there are considerable overheads involved in running a commercial music school, the teacher themselves often has little to no say in how the business is structured and run, and thus has little to no input into how much of the “service price” they receive at the end of the day. Using principles of economic rationalism, the teachers (or service-providers) are simply part of the overall profit-making apparatus, which may also genuinely strive to provide a quality product, but determines teacher wages based on desired surplus or profit at the end of the day. The financial benefits of the transactions between teacher and student, ultimately, flow-on to the directors, owners and/or shareholders of a company, who generally invest with a view to maximising return. In a worker-owned enterprise, workers not only have a direct stake in their own livelihoods, but also have the power to decide to do business in ways that benefit the broader community. Worker-owned collectives tend to create long-term stable jobs, sustainable business practices, and linkages among different parts of the community. In addition to providing meaningful jobs and asset-building opportunities for workers of all income levels, real democracy is practiced on a day to day basis, forming a model for social justice and economic empowerment. We feel Worker-owned Cooperatives can be one of the most powerful vehicles for social change because, unlike even charities where workers are usually paid a retainer or salary to do necessary work, our workers have set the parameters of their work, own the fruits of their labours, and directly determine the nature of their transactions with students and other clients. Thus workers are completely invested in their work, because it is literally _their_ work. We feel that the flow-on benefits for students and other clients are obvious. Our Cooperative is a Non-Trading Cooperative, which means that any profits or surplus income generated cannot be distributed to individuals, but must be used for the benefit and objectives of the Cooperative. Any surplus generated by the business – though the generation of surplus is not the primary aim of the businesses – gets fed back into the business via reinvestment. Our workers get to decide what our priorities are in this regard, paying careful attention to our founding principles. At Browning Street, any surplus is usually reinvested into: ** Enhancing facilities; ** Professional development; ** Improving equipment and systems; ** Providing subsidised training and teaching to those who cannot ordinarily afford to access our services; and ** Adding capital to our Special Projects Trust. Surplus is The Cooperative’s reward (and incentive) for providing quality products, establishing and maintaining relationships with students and other clients, and exercising sound business practices. We believe that good business principles are important, and as we are independent and self-funded, provide extra incentive to focus on the quality of our products and services. This idea that we have to survive in the “real world”, rather than seeing ourselves as a dependent Government- or Corporate-funded entity, encourages flexibility, adaptability and efficiency without jeopardising our core values and objectives. We feel that external funding for our day-to-day operations (“pity money”) breeds complacency and dependency. We are an autonomous, worker-owned organisation who have made an ethical decision to reinvest any surplus back into the facilities we provide to our members. We also hope that by providing a strong professional support base for musicians and other creative professionals, we can generate a surplus of energy and resources for reinvestment in broader artistic communities. Via our “Special Projects Trust”, we hope to allocate financial surplus and volunteer labour towards the further building of creative spaces for art production and for music education, as well as community programs further afield. Our location in the inner-city of Australia’s fastest growing metropolis is no accident. Musicians and other creative practitioners are often the first to be pushed out of the inner-city when rents rise, but here at Browning Street Studios we recognise West End’s role as a long-time hotbed of creativity, activism and battles for space and see no reason why this should change. This idea of space – space to grow, space to learn, space to be seen and heard in the world – is central to our own business. We believe that space – affordable and accessible space – is vital to our unique West End economy and helps us, as creative practitioners, to strengthen and grow. Working alongside our colleagues in colocated facilities also enables us to access possibilities for cross-fertilisation of ideas, group teaching, workshops and professional development. We encourage, support and challenge each other, learn from each other, and work together within a framework of quality alongside possibility. Our vision is to provide the space for musicians and other arts-industry professionals to build sustainable micro-businesses that are mutually supportive and complement the building and strengthening of a local community economy. Our investment in space recognises the importance of accessible and well-equipped professional spaces for persons employed in industries that rarely generate opportunities for home-ownership. We also refuse to take part in government or real-estate industry-led reconfiguration of inner-city spaces, instead taking the firm position that the future of West End lies in the hands of the local community. While we recognise the huge contributions of the creative arts to civic life (and hence the reasons for Government investment in the creative arts), we also value our rights to creative and economic autonomy. For this reason we remain independent and self-funded. For special projects, we raise capital via worker investment and crowd-funding. Our investment in professional excellence via education is firmly grounded in a commitment to a more egalitarian approach to music education. While many of our teachers have benefitted from a Conservatorium-based education, we feel that musical training (including a traditional “classical music education”) should not be the privilege of a chosen few, and do our best to make both music education and careers in the arts open to persons from a wide range of backgrounds. To achieve this we provide a range of pricing options, from more traditional user-pays systems through to community classes, apprenticeships, scholarships, work experience and on-the-job training. Archerd, E. (1997) “Cooperatives and Profit: What is the Relationship?” (online) available: http://www.wedge.coop/newsletter/february-march-1997/cooperatives-and-profit-what-is-relationship/, November 11, 2013. CICOPA (2003) “World Declaration on Cooperative Worker Ownership” (online) available: established some basic standards for worker cooperatives in the World Declaration on Cooperative Worker Ownership (also known as the Oslo Declaration) at a meeting in Oslo, Norway in 2003.